Although normally based at Milford Haven, Svitzer's 2008-built tug SVITZER WATERSTON had been one of the company's tugs brought to assist the local vessels during some of the container ship movements in Loch Striven last year. More recently she had been temporarily based at Liverpool, from where she came north to supplement the Clyde fleet and provide standby fire cover at Finnart while FRONT OPALIA was discharging. 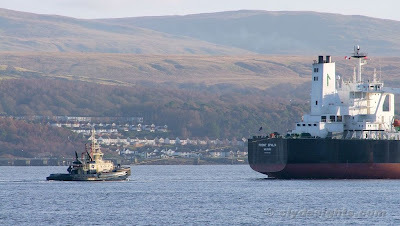 Still made fast aft as the tanker passed Inverkip, SVITZER WATERSTON was returning to Liverpool to resume her duties there.